Hello friends! If you follow my crafty twitter handle @WCBCraftStudio, you know that last Tuesday I lived my best digital life during the premiere episode of NBC’s new hit show Making It, live-tweeting and commenting on the most memorable moments. From Amy and Nick’s pun-offs, the projects, the creativity, and the whole feel-good vibe of the show, I hereby submit my application for Full-Time #MakingIt Stan and Ambassador. I will only take on projects that I can realistically make. If there’s something like woodwork or crochet/embroidery involved, I will skip that challenge. I will only use materials I already own to complete the challenges. I have way too many craft supplies that due to my workload I won’t be able to put to use any time soon, so what better way to get creative and spend less? This will probably restrict me in future challenges, but that’s for the best. I’m not allowed to spend ANY money on materials. We love a fiscally responsible crafty queen! If there’s a challenge that is similar to a craft I’ve made in the past, I will simply refer back to those projects, and won’t make anything new for it. Ok, I think that covers most bases. With that said, let’s get to last week’s challenges! Fast Craft Week 1: for this challenge, the idea was to get to know a little bit about the crafters, their personalities and preferred mediums by asking them to make a 3D animal that represented them. I’m a big fan of unicorns and dolphins. Since Amber chose a unicorn for herself (because of course she did, since we’re soul sisters and all), I’ll go for the dolphin. I had the idea that because it’s a dolphin and I love water and I wanted to work with card stock, I could try to decorate the dolphin like those tiles in the pool with the white grout showing in between? Check out the journey! Here’s the step by step progression of the dolphin going from 2D flatness to 3D glory! And here is the final result! Master Craft Week 1: last week’s first big challenge involved the makers getting creative by pulling together an unconventional photo album and a quilt made out of any material except fabric – both crafts were meant to reflect their personal family heirloom/history. For the unconventional photo album, I’m going to tap into my repertoire and bring back the big number 80 I made out of photos for my grandma’s 80th birthday. I crafted that baby from scratch and I think it’s a nice show of family heirloom and my craftsmanship! For the quilt, I honestly would’ve probably chosen paper as my medium just like Amber did, so instead of going down a rabbit hole of endless paper-cutting, I will just link to her awesome post where she reveals some filming secrets and the super cool historical background that made way for her paper quilt! My friends, I cannot express – truly – how happy this show makes me and how much I’m looking forward to the next episode. I even have some conspiracy theories brewing about what the next challenges will be based on the patches they use as weekly prizes and I just can’t wait to see it all unfold. How do we only have five episodes left?! My heart weeps. Did any of you recreate any of the challenges from the first episode? Drop some links in the comments below! Crafters Unite! ‘Making It’ Premieres Today! Amy Poehler/Nick Offerman AHEM LESLIE KNOPE/RON SWANSON REUNION! For all of us Parks and Rec fans, seeing these two on screen together again is LIT-ER-ALLY the best thing ever! And the combination couldn’t be better. An established craftsman and woodworker like Nick + a non-crafter like Amy = the ultimate match made in heaven for TV to capture all kinds of audiences. Whether you craft or not, you are represented! THE MAKERS! Guys. I am SO EXCITED for this casting. You’d think I know the contestants… and that’s because I kinda sorta get to say I do! Amber Kemp-Gerstel and her gorgeous flower headband is one of the eight makers that were cast on the show. Even though she’s originally from the Bay Area, she’s been living in South Florida for years running her Damask Love crafting business and she is EVERYTHING. I got a chance to talk to her once, and she’s just the best human ever. I’ll be rooting for her and everyone from Miami should too! 4. The Press Junkets/Promos! If there’s one thing I enjoy about movie and TV shows are the press junkets that the actors do leading up to it to reach all possible audiences. From the Today Show crafting session to Amy’s appearances on late night shows with Jimmy Fallon and Seth Meyers (with hilarious stories about how she met Nick), to the pun-offs, and all the content on the Making It YouTube channel… I’m IN IT! I must confess, another reason I’m so excited about this show is because when they were casting for it I actually considered entering… until I saw the application and felt my skill-set wasn’t as broad as I wanted it to be to put myself out there on TV. And now that I’ve seen the lineup, I’m so relieved I didn’t apply, or I might have been the first to go home lol! I’m sure there are more reasons but as you can tell by my overuse of exclamation marks and capitalization, I’m not very coherent right now. Point is, I simply cannot wait to watch the premiere and whole series and I’m already praying for a Season 2 and this first one hasn’t even started. I hope you all join me tonight as I’ll be live-tweeting the show from my @WCBCraftStudio twitter account. Let’s make #MakingIt trend! Y’all THREADY for this?! Consider this my official application to FULL STAN status to Mr. Kate, her entire brand, her life, her hair, I’m here for ALL OF IT! She is a savvy, trend-setting businesswoman: because of her family, Kate could probably pull strings to get a show on HGTV or any home improvement channel, but what she did instead was to put on a TV-quality show on YouTube, and is probably THE top interior design content creator on the platform. QUEEN. Also, she’s an author and runs a retail operation with beautiful merch on her website. Helping & giving back is important to her: lots of entrepreneurs on the rise are solely focused on succeeding and reinvesting earnings back into the business, but Kate has a strong conviction to give back to the community (or to fans) in various ways. For every 100K subscribers reached on YouTube on her way to one million, she gave 1K to charity. When she reached the million subscribers milestone, she gave away a 10K makeover to a fan. One of the charities she donates to is the LA Youth Network, which helps homeless and foster youth in the Los Angeles area find their footing in life with transitional housing. Aside from the monetary donation, she also dedicated and donated one of her makeovers to their center, to make it an even better environment for the teens. She’s unconventional, a total #CreativeWeirdo: if you’ve seen any of her content, you know she’s completely unafraid to take massive fashion risks on a daily basis (despite being bullied for it earlier in life), and I think the pink hair has brought that out in her even more. Her business name is Mr. Kate because she wanted to beat the girly image stereotype and beat down barriers. In one of her videos she spoke openly about not really being the type of girl that wanted to get married, so her and her partner Joey simply had a courthouse elopement which her accountant recommended for ease of paperwork and filing taxes. She doesn’t wear an engagement or wedding ring, yet her and Joey couldn’t possibly be more committed to each other, being partners in life and business. She is unapologetically herself and is a huge advocate for everyone expressing their individuality as well. She is confident in her work, but also extremely humble: there’s something my dad ingrained in me since I was little, and it was an admiration for humility. He is really not a fan of cocky people at all, and his disdain for overt conceit was directly funneled down to my DNA. Anyway – this is something that I really admire in Kate, she truly walks the line between confidence and humility so gracefully. You can tell she believes in herself and her vision when she does makeovers for others (which is so nerve wracking, to get someone’s taste and create an entire environment for them based on that, it’s insane! ), but she also is genuinely relieved when people love the outcome of her work, because at the end of the day, creativity always comes with a dose of self-doubt. She keeps it real, for real: even though on her makeover videos she sticks to her cheery side, on other more personal videos, on her book and when it comes to social media, she is more unfiltered and open about the not so glamorous side of life – which is not common among public figures. One of the things she does that I admire the most is when she shares her creative process for designing her bullet journal (a type of more free agenda-running), and she unabashedly includes the pictures of all pages listing when she has things like therapy – which still has a huge stigma attached to it, and to someone like me that is incredibly reassuring. Seeing someone that seems to have it all figured out in life taking care of her mental health in spite of stereotypes and any backlash is absolutely inspiring and admirable. As you can see, my love and admiration for Kate only grows with every video and I pride myself in learning from her and looking up to her as a virtual mentor. I am a proud member of the #CreativeWeirdo family and I look forward to everything she’ll continue to create and make over in the future. HSN 24-Hour Craft Events Are THE DEVIL! Two weeks ago today, HSN was having one of their “24-hour craft event” programming days, where from midnight to midnight, all the products they show are craft-related. They’re also known as “Kathy is definitely filing for bankruptcy soon” days in my inner circle. I always hope and pray I don’t find out about the crafting days so that I’m not even remotely tempted to spend money on anything, but with my religious following of crafter extraordinaires like Amber from Damask Love, Beth from Kingston Crafts, Anna Griffin & Sara Davies from Crafter’s Companion, it’s absolutely mission impossible. We R Memory Keepers – Alphabet Punch Board: When I tell you that I will be in physical pain if I don’t buy whatever Amber shows, I’m not kidding. As soon as I saw her punching out letters in seconds, I could see myself making 387845437984 banners with the punch board. Even though I have a Cricut machine where I can cut literally anything in any size, sometimes I don’t want to crank it up and do this whole operation with mats and digital designs if I’m making something simple. Please recycle this same explanation for 95% of the products I’ll list below. I have, unfortunately, not yet used my punch board 😦 but I will! Xyron XRN510 Creative Station: I believe Beth is the one to blame here for selling this so well, but honestly the Xyron adhesive products family sells itself. I’ve actually used it a number of times when I’ve had intricate items that I need to stick but don’t want to use glue for, and it made my life so much easier! I did have to go back in with a weeder to take out the adhesive from the holes, but no biggie. Still saved me tons of time! The Diamond Press by Crafter’s Companion: Sara Davies could sell me a used needle if she wanted to. She is such a masterful crafter and showcaser of items, that I am defenseless against her charm! She showed the Diamond Press on its launch day at HSN, and I got it with the auto-ship (when they release more die cuts in future months and you sign up to get them automatically as soon as they come out). I haven’t used it either, but I already have a couple of events/ideas lined up to use it in the near future (::cough cough:: #MyBestFriendsWedding ::cough cough::). We R Memory Keepers-Banner Punch Board: Amber, I’m going to start billing you for my purchases. Why do you do this to me, girl? You sold me on this so hard, I couldn’t turn away. And don’t even try to act innocent, I got receipts! 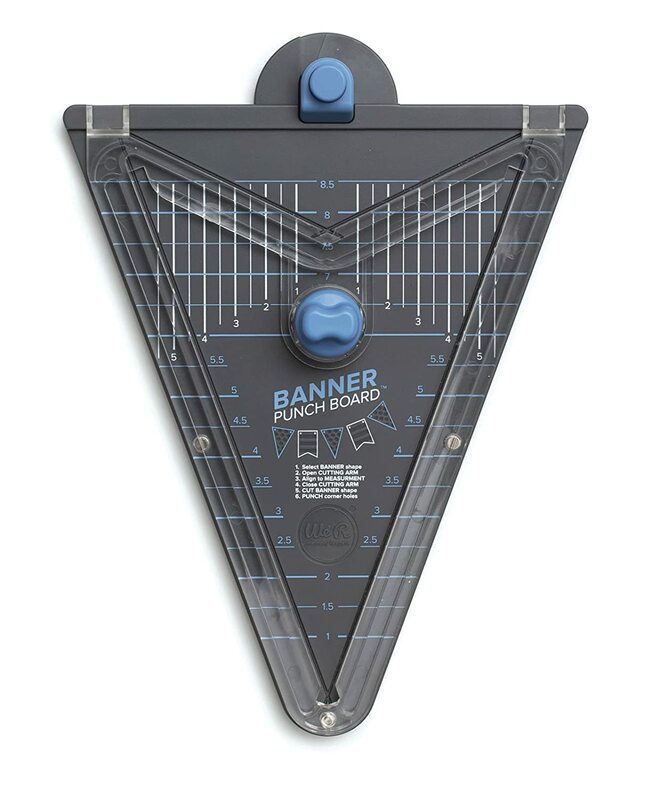 Anywho, I bought this baby because again, I might not really feel like jump-starting my Cricut to cut big triangles for a banner, nor do I want to do it by hand. This seemed like a good enough reason to buy the punch board, and I did use it right away to create a banner for a friend’s birthday! Xyron Sticker Makers Magnet Tape & Mega Runner: Since one of my crafty friends raved about her ATG tape runner gun, I’ve been wondering whether or not it’s worth the investment for me, but I hadn’t settled on it until May 9th, 2017, when HSN decided to bundle a Xyron tape runner with two sticker maker mini stations AND a magnet tape roll as well, all for $29.99. Who can say no to that?! If you can, I don’t trust you. 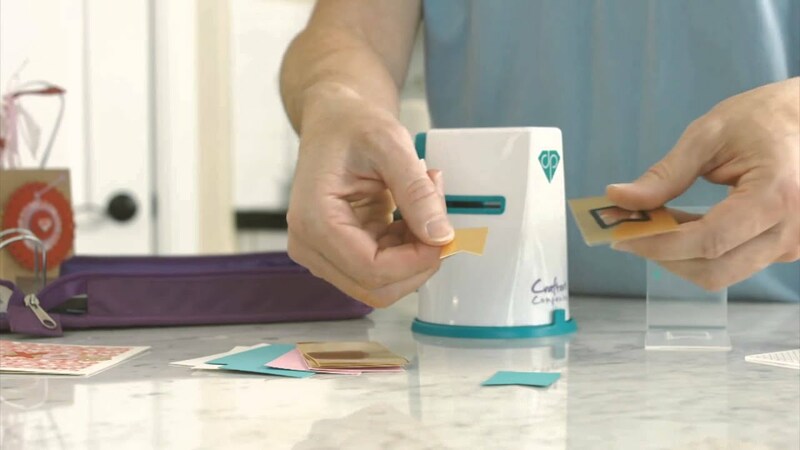 Crafter’s Companion 3D Embossing Folders Set: I don’t have a Cuttlebug (kind of like the Diamond Press, but bigger), I’ve never wanted one and I never thought I would, but when I saw Sara Davies making this on live TV, I have never wanted something more in my life! My crafty friend offered to gift me her old Cuttlebug machine and I said DONE! I took advantage of the Flex-Pay option HSN was offering that day so that I wouldn’t feel as guilty seeing the full price in one swipe, and now these stunning folders are mine! I almost bought the gold wax they use to get this effect, but they were sold out. Things selling out are my only saving grace. I love all of these things so much, even if I haven’t had the chance to use them as much yet. I know I’ll make use of them soon, whether it’s for items for #MyBestFriendsWedding or for any other event, I’ll get my money’s worth. In the meantime though, I think I should stay away from any upcoming 24-hour craft events for my well-being (and my wallet’s!). AHHHHH GUYS!!!!!!!! My best friend is getting married! How awesome is that? SUPER MEGA AWESOME! Now as you can imagine, this is every crafty person’s dream come true, because with all the joy and none of the stress on oneself, the crafting possibilities are endless. I want to make ALL OF THE THINGS, and oh, I will. Michelle and I have been best friends along with our group for now almost 10 years (crazy!) and we’ve been through a lot together, which is what builds a super strong friendship, but even better – her family loves me and I love them, and they’ve borderline adopted me into their circle as well, so this feels like my real sister is walking down the aisle, and I’m alllll in my feelings! The best way to deal with those, you ask? Crafting, of course. So first things first – I got a head start on the engagement surprise because her fiance reached out to me for some advice on the ring, and as soon as I got that text, you know my head went into overboard mode of what to make her/get her so I could put together a nice little “welcome to engaged life” gift for her. I wanted to give her a personalized mug, but the time frame was short, so I wouldn’t be able to place an order and thus, this would be my first wedding-related DIY project! I love all the “feyoncé” merchandise I’ve seen around, so I wanted to have the mug say that, but I didn’t want that to be the only thing on it… It had to be more personalized. So I decided to do something on both sides, and bam! Perfection. Finally, Michelle’s mom asked me to make a version of these very funny props that say “He asked” and “She Said About Damn Time,” so I found some faux wood card stock and got to work. I also brought a long a set of my standard engagement props so that we could play around photo booth style after the proposal. All in all, it was a great first opportunity to put my craftskills to use, and the beginning of a loooonggg road of engagement-and-wedding-related crafting ahead! I want to introduce you to… My talented crafty friends & family! People say a lot of who you are is a direct result of your environment and those closest to you and upon some reflection, I’ve come to realize how much of my love for crafting has been reinforced by those around me. Of course, I’ve got tons of support from non-crafty people (which are the majority of my close relatives), but I am so happy to be able to share my craftventures with both friends and family that are just as excited about getting their hands dirty with DIYs as I am. Some of my earliest memories include feeling happy finger-painting at school, and admiring my cousin’s drawings and wanting to be just like him (funny enough, I only just discovered I can actually draw, like two years ago! You’d think I would’ve attempted it because I was so inspired by him, but it appears I focused on other crafty endeavors…). He’ll definitely have a post completely dedicated to his stunning work! At summer camp, I wasn’t much of an athlete so I’d run off early each day to schedule my activities and make sure I got a spot at any of the crafting disciplines they offered, especially pottery. I even got the Arts & Crafts trophy at the end of my season. My cousin, my tia, my grandma, and so many of my crafty friends and family members have helped me learn more about myself, gain confidence in my skills and supported me with advice on DIYs, orders, dealing with customers and beyond. Now I want to highlight them in this series called Friends & Family. Stay tuned, as I’ll be showcasing them individually on this blog! For the most part, crafters and craft shop owners have a little bit of a niche, whether it be paint, paper crafting, glass work, wood burning, etc. I, on the other hand, am all over the place, excited to experiment, trying to soak up and learn as much as I can, and living out my wildest #craftasies. I enjoy this freedom, and though I’ve been working heavily on the paper crafting and painting world, I’m currently dabbing my feet in the unknown waters of Vinyl. The way I feel about working with vinyl is the same feeling you have when you like a guy who has a little bit of a dangerous appeal, and you know that the relationship has potential, but you’re scared of getting hurt… You know? I have problems. I’m aware. I never heard about vinyl prior to getting my Cricut Explore, which I planned on using exclusively for my card stock crafts. Then, my friend (who saved my life and taught me how to use my Cricut when I was struggling HARD with YouTube videos, so THANK YOU KATHY!) invited me to join a couple of Facebook groups called Let’s Learn Cricut Explore and Cricut Lovers Guide to Design Space (admin approval is required to join), which she told me would be a great way to get acquainted with the Cricut’s features and I could ask questions to the members – currently over 20,000 in each! So I joined, and realized that the vast majority of the members worked mostly with vinyl (or Heat Transfer Vinyl/HTV) to make decals or clothing accents. It looked cool, but scary. I was intimidated to try any vinyl projects, because it just looked like a sticky situation (HA! get it?) and like I could mess it up easily. I avoided it at all costs and even though my Cricut brought a sample of vinyl, I refused to open it… Until I had to make an item which I knew would only make sense to be made with HTV. My friend was turning 26, and she mentioned that she wanted a sash that said “26 & Fabulous.” So I mustered up my courage, bought some glittery HTV, followed the instructions I remembered I’d seen in the Facebook groups countless times (mirror the image if necessary, check your settings, use chalk powder to show the lines when weeding, etc.) and got to work! Until I got to my first major roadblock: I couldn’t find an iron in my house. For HTV to work you NEED heat to stick it to the fabric. But fear not, because I tend to get REALLY creative when I’m in a craft jumble… So I figured, since it’s a sash, I could probably pull this off with my Hair Iron! Hair iron to the rescue! All properly heated and stuck! After this, I felt a teensy bit more confident and willing give the permanent vinyl a chance, perhaps even decorate my Cricut machine (a lot of crafters do it!) so I decided to order a stack of sample colors from Amazon to have them handy for whenever I decided to step up to bat… Which didn’t take too long! First, my mom’s friend asked me if I could make a decal for her car. Like, PERMANENT. And it had to come out right because it doesn’t come off easy and it was for her business. So I got to work, and I even stuck it on her car myself 🙂 She LOVED it! Any pro vinyl crafter out there will know that this is cake. The real test of vinyl craftsmanship is layering, i.e. cutting out each component of the image in its respective color, and then layering it appropriately to create the final image. And you know where I’m going with this – someone asked me for something that I knew would look best layered! My best friend wanted to do something cute for her son’s second birthday at school. She wanted to send some favor bags for his classmates, and she wanted them to be Mickey themed since that’s his favorite character. I came up with a design idea, and she loved it, so now it was time to work! Mickey heads with their names on them? Let’s do it! The order of the component DOES affect the result! Stay in Touch with WCB! What’s in Stor… on I’m Moving!